Pick up any finance-related trade publication and you’ll likely find at least one article on the modernization of finance – also referred to as finance transformation or digital evolution. In this blog post, I will explore the drivers of finance modernization, as well as what is needed to support this evolution and how to make the business case for needed investments. The factors at play will inevitably impact all finance organizations sooner or later. Based on my experience in working through technology and business disruptions of the past, those organizations that take a proactive, comprehensive approach will see the biggest benefits. Why is modernization or innovation needed? Regulation is a major driver behind modernization. IFRS 9, 15, 16 and 17 all require the calculation and reporting of highly detailed, granular data. This means data governance is fast becoming a hugely important function for finance. 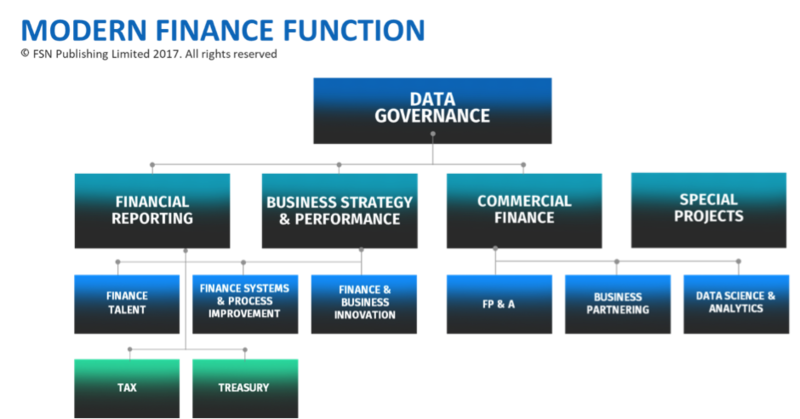 In fact, Gary Simon of the Modern Finance Forum (FSN) on LinkedIn believes data governance will become the most prominent function for modern finance, as shown in the chart below. Forward-looking capabilities and predictive analytics are more and more important in order to be agile and flexible as a company and to provide meaningful business partnerships with operations. I believe that the office of the CFO needs to provide reliable financial and non-financial information to all stakeholders faster, more efficient at lower costs with excellent presentation capabilities. How can a system support modernization? What are the characteristics of such a platform? Since 1992 when I started my career in the Enterprise Performance Management (EPM) industry, I have been a strong advocate for innovation. Today’s internet-based technologies, better designed user interfaces, and mobile devices are coming together in systems that can significantly contribute to modernization. Modern EPM systems combine deep domain expertise, understanding of professional workflows, and intelligent technologies into a unified solution that can support all aspects of the planning and control cycle with analytics and insights at the right time and format. In order to successfully fulfill the role of business partner, modern finance professionals must have the skills and supporting technologies to meet expectations. Without a doubt, a unified finance transformation platform for EPM can provide the support needed. A low total cost of ownership and rapid return on investment. How can a business case for the modernization of finance be created? What are the costs, upfront and hidden, to maintain the legacy systems and disparate tools now supporting the office of finance? What are the tangible and intangible benefits of improving, automating and unifying processes? Consider potential time savings related to data collection, data quality, less reconciliations and reporting. What value is created with better process management and governance? What risks can be eliminated or minimized? What potential new opportunities might be exploited? How to keep and grow finance talents by providing the rights tools? With a finance-owned platform, it is easier to bridge the gap between finance and IT and reduce maintenance overhead. Self-service reporting for end-users also reduces costs. When master data and data management are improved, total cost of ownership goes down while return on investment goes up. In my experience, I have seen many implementations in which closing processes are reduced by many days or even weeks and IT infrastructure and maintenance costs quickly go down. Now is the time to start planning your own organization’s journey to modernization. We urge all companies we work with to think beyond near-term regulatory compliance changes and consider broader, long-range business goals when mapping out a technology strategy. I welcome your thoughts and feedback on this topic.